Historians and critics may curse Raised on the Sunset Strip for presenting a documentary which features some pretty plainly revisionist history of the 1980s L.A. rock scene in general and Guns N’ Roses in specific, but there’s no way to deny that the film tells a really interesting story â€“ at least at first. It is, of course, the story of Saul â€œSlashâ€ Hudson and the series of events which made him a guitar icon; the story of where he came from, who he was associated with both personally and musically and how those paths converged to make one of the most famous rock guitarists of the twentieth century. 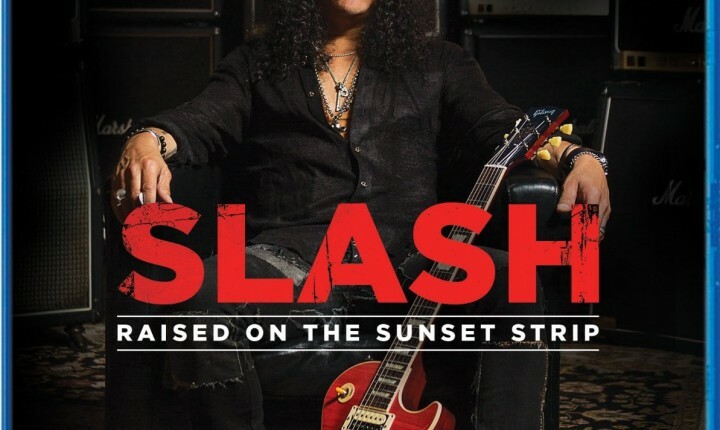 At its outset, Raised on the Sunset Strip does a really good job of setting up both the characters and the stage for the story; Slash himself tells of growing up in Los Angeles (no mention of the fact that he was born in the UK is made) in the Sixties and early Seventies and paints the image of a very romantic place and innocent time â€“ when hippies ruled and lived contentedly where Slash was raised by a costume designer and and a man with strong ties to the music industry (a family friend was David Geffen) before picking up a guitar around the age of ten and falling in love with the instrument forever. After that, his fate was sealed; with guitar in hand, he formed Road Crew with school friend Stephen Adler and also enlisted Duff McKagan, met Hollywood Rose singer William â€œAxlâ€ Rose and put together a new outfit with all of them together called Guns N’ Roses. They then began working on Appetite For Destruction â€“ the band’s debut album â€“ all within about seventeen minutes’ worth of footage. Of course, everyone knows Guns N’ Roses did come together quickly, but not that fast. It keeps the story moving smoothly though, and it’s easy enough to forgive any factual omissions at that point in the film. However, for no discernable reason and seemingly out of nowhere, the film begins to flounder. Suddenly, the sequence of events in the film becomes fractured when discussion turns to the making of Use Your Illusion I and II (there is no mention of Lies at all). Discussion of the guitarist’s life and wellbeing during the Eighties becomes very superficial very quickly, and the focus quickly shifts to a superficial covering of Slash’s Snakepit before jumping headlong into Velvet Revolver discussions; ostensibly leaving the time between 1992 to 2002 covered in a half-assed manner at most. Not only that but, unlike the input from Steven Adler which featured real memories and commentary of the early GNR days, Matt Sorum’s input (during the short look at Use Your Illusion) is charaterized largely by some light bravado and Duff McKagan’s contributions (which do have some potential â€“ had they been allowed to develop) are abbreviated at best. Oddly, this middle-playing of the documentary features input from Dave Grohl too; granted, his input would be valid if his contributions to the film were more than anecdotal (yes Dave, we know Axl and Kurt Cobain had a conplicated social relationship and, yes, we know you played on one of Slash’s songs), but they aren’t really â€“ so the drummer’s appearance just feels like an act of the filmmaker including him just because it was possible to do so. About twenty-five minutes before the credits roll on Raised on the Sunset Strip, the film begins to spiral in circlesand seems to forget what it was originally trying to present. Discussion begins to veer awkwardly from Velvet Revolver to Slash’s Snakepit to Myles Kennedy and back again, and the only consistent statement which holds the film together are those of admiration of Slash’s talent (which get made by everyone and then proven by some performance footage), with a few other confirmations of it made by Steve Perry (who also tells a rudderless story which culminates with â€œSlash has my guitar, but I’m glad he likes it) and Lemmy Kilmister. Any resolution of the Guns N’ Roses or Velvet Revolver threads in the documentary are forgotten, but Myles Kennedy and Slash indulge in a bit of mutual admiration before the credits roll. While it most certainly does not end smoothly (or particularly well) and leaves lots of story threads hanging, it would be unfair to call Born on the Sunset Strip a total write-off. The first half of the film still bears a lot of promise and holds up under repeated plays (one of the better discoveries to be made in it is just how well-spoken Slash is), but it falls apart after focus turns to later work and performances (which would be better served on a live concert DVD). It’s unfortunate and this critic’s first instinct is to hope that someone (perhaps a more experienced filmmaker) will take the raw ideas developed in the early running of this DVD and develop them into a more satisfying documentary. It might happen, it might not â€“ all we can do is hope.